Dove announces a two-year global partnership with Cartoon Network's Steven Universe to educate young people on body confidence through the cartoon's themes of inclusivity and empowerment, world and characters - going directly to them in a medium they know and love, something that has never been done before. Later this year, an original song featuring the cast of the show, an accompanying music video, and an educational eBook will also be launched adding to the Dove Self-Esteem Project's commitment to create a media landscape for young people that is inclusive by acknowledging every person's uniqueness and representing true diversity. "Cartoons are a powerful medium when it comes to empathy and understanding, which is why my team and I take great care with Steven Universe to reflect real issues that affect our audience," says Rebecca . "I'm grateful that I will have access to a plethora of research on body image and mental health thanks to this partnership with the Dove Self-Esteem Project. This is an issue I have struggled with personally and I hope this will be a chance to amplify positive messages about self-awareness and acceptance." Cartoon Network's Emmy-nominated Steven Universe revolves around Steven, the "little brother" to a team of magical aliens-the Crystal Gems-who defend the planet Earth. Steven is the son of the Crystal Gems' late leader Rose Quartz and aging aspiring rockstar Mr. Universe. Steven belongs everywhere and nowhere: he has inherited his mother's Gem and her magical powers, but also his father's humanity and charm. 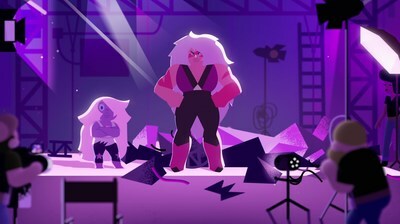 The show is a slice-of-life action comedy that follows Steven as he attempts to bridge the gap between the sci-fi fantasy world of Gems and the cozy, funny, simple-yet-extraordinarily-complicated world of human beings. Steven Universe is created by Emmy and Annie Award-nominated writer and New York Times bestselling author Rebecca Sugar, and produced by Cartoon Network Studios. Cartoon Network is Turner's global entertainment brand and the # 1 animation network in the U.S., offering the best in original content for kids and families with such hits as, Adventure Time, The Powerpuff Girls, Steven Universe, We Bare Bears and The Amazing World of Gumball. Seen in 192 countries and over 400 million homes, Cartoon Network is known for being a leader in innovation with its approach to engaging and inspiring kids at the intersection of creativity and technology. Its pro-social initiative, Stop Bullying: Speak Up is an acknowledged and often used resource for kids and adults looking for tools that can assist in dealing with the ongoing issue of bullying. Turner, a Time Warner company, is a global entertainment, sports and news company that creates premium content and delivers exceptional experiences to fans whenever and wherever they consume content. These efforts are fueled by data-driven insights and industry-leading technology. Turner owns and operates some of the most valuable brands in the world, including Adult Swim, Bleacher Report, Boomerang, Cartoon Network, CNN, ELEAGUE, FilmStruck, Great Big Story, HLN, iStreamPlanet, Super Deluxe, TBS, Turner Classic Movies (TCM), TNT, truTV and Turner Sports.